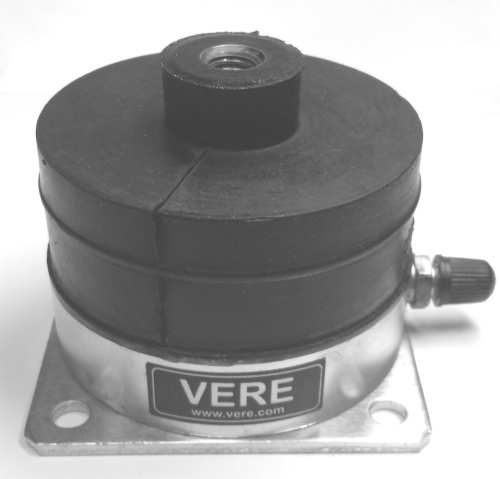 A set of (4)- 300 lb capacity, Vibration Isolation Canisters. Total load capacity of the set is 1200 lbs. Requiring a pump such as our VBB-P to inflate. Uses include additional Vibration Isolation under an Optical Breadboard. Breadboard adapter plates are available, (VIC-MP). For direct mounting to screw holes in bottom of breadboard. A seperate System Mounting Plate (VIC-MPxxyy) is available. This will be (1) mounting base for the (4) units together. Cost is size dependant. Call VERE sales for pricing.